Duke Ellington’s superhuman inspiration and productivity are described here with rivers of fire and water in dialog with the universe. 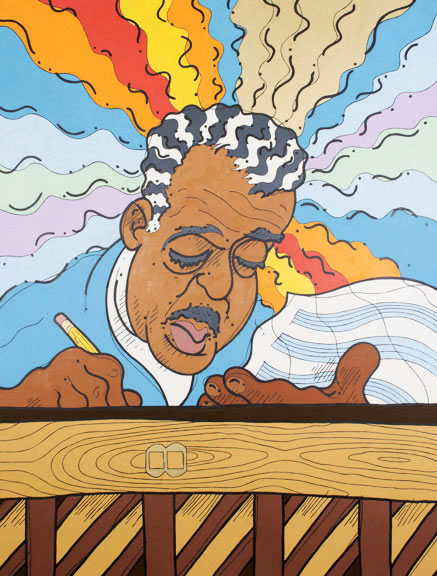 His hair is highlighted to suggest piano keys and to resemble the art found on vintage jazz sheet music. He wears a choir robe to remind us of the early musical workout so many black musicians received in the church. The face on the pencil is a nod to Max Fleischer, a sometimes client of the Duke. Anyone who has spent any time in grade school music class or choir practice can recognize the back of an upright piano. The title riffs on Ellington’s “East St. Louis Toodle-oo”.